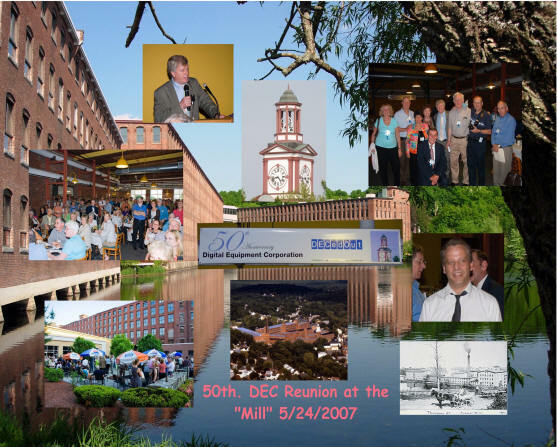 DEC Connection's 1st 50th Anniversary Reunion Celebration Gallery - evening of May 24, 2007 at the Maynard "Mill"
“The Mill” by Joe Mullin – President of Clock Tower Place - recounted the History of the Mill from the American Woolen Mills, the DEC years, and the present story of the mill. Click here: We are offering free “Financial Makeover” seminars for former Digital employees, family & friends. 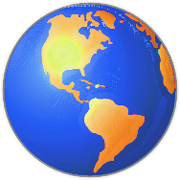 , a successful marketing promotion firm, was started in 1993 by former Digital Employees Patte Powers and Rod Griffith, now DECedOut members and sponsors! I just wanted to say how very much I enjoyed the Thursday night event. You can't go home again, I guess... so when did that parking lot spring up? When did the main entrance of Building 12 disappear? Oh, well. Times change. So nice to see a few old faces (and boy are we old faces at this point!) and to see the Mill again. What an impressive facility it's become. If you'd like to see a few of the pictures I took, visit http://mcole115.photosite.com/ That was also where I put the Gordon College photos. Since then they seem to have added a horrible amount of busy advertising which hurts anyone's ability to look at the photos, but they're there if anyone would like to see. Let me know if you learn about photo sites of the evening from anyone else. Best wishes and thank you for a lovely event! Deborah Gomez, Digital Payroll Dept. Just wanted to say that I had a great time last night in Maynard. It was WONDERFUL to see so many people. Digital will always be my extended family. Hope to see more gathering in the near future. Alex Tellert Thanks for putting on a great event... I enjoyed it immensely. Everyone that I spoke to had a wonderful time as well, reconnecting with old friends and co-workers was the best. Nancy (Goodwin) & Bob Heinlein Yes, last night was amazing. We couldn't believe how many people showed up. I had been with about with 4 groups while in Digital (22 years) and had a ball reconnecting with a lot of people. I took the tour with a bunch of my old staff, and that was fun too. I had been at EDS until about 1 1/2 yrs ago and they used to be in the Mill so I was familiar with all the amazing changes. Sandy (Zimany) Day Congratulations to everyone on pulling off a miracle! What a wonderful event you all planned, promoted and supported. How extraordinary that you were able to scale it up so dynamically! Please convey kudos to everyone involved. It was good to see Paul (Mauro) and I hope Legacy got some good leads from the folks at the event. And I hope that the folks from Clock Tower Place accomplished their goals - they were certainly WONDERFUL hosts. It was great to see so many folks, many of whom registered late or just walked in. Jim (James E) Kelley And a great time was had by all. Thanks to everyone for all the work of bringing the event together! Marion Dancy & Terry Cullen Just a note to say the event last night was awesome!! Congratulations to you and your team!! Thanks for all the terrific organization and opportunity to catch up with colleagues from long ago. Well done! Susan Slane I’d be interested in attending the Sept. cookout! Had a blast at The Mill reunion last night! Dale Donchin Just to let you know that I thought the event was fantastic! Well-orchestrated, especially considering the huge turnout. Well done! Vanessa Fox Congrats on a great event! Nicely done! Had a great time! Saw many folks I knew and hadn’t seen for a while. Connie Pawelczak - Digital 1981 - 1999 Just wanted to say that the event last week was great, and I'm glad I went. You all deserve a big thank you for your planning and hosting this. I will look forward to the next one in September and will also send in my membership dues. Steve Blanchette Saw many new people. I don't often see anyone from DEC except the few people at EMC. It was a blast. Thanks for doing the hard work to pull it all together! Deena & Len Segal Thank you for a very nice reunion on May 24th. The Mill will always be a special place for us. Deb Keeney It was a wonderful event and thanks for your part in it. I have already signed up for September event. George Wright Thank you for arranging such a great event. Carolyn Abbott I did meet the people I wanted to see to solicit leads for our sales position, and I was amazed by how many already knew about our business from the website. I was surprised by how many people from my old Sales Training group were not there... I plan to either call or email them to let them know about the organization, website and the fall event. I had a wonderful time... my husband enjoyed it, too, even though he didn't know anyone. Willow Shire ...What a nice event you organized; what a lot of work and what a huge success. Congratulations... I look forward to seeing you in the Fall. Paul DeVivo Loved the reunion. Met the guy who hired me in 1976 (Steve Davis), and several others who I worked with over 16 years until 1992 (SERP). One of the things I did was manage the ELF Version 2 deployment and email gateways from DECnet to the Internet. Fred Kulas I'd like to join the DECedOut organization. I did attend the Digital reunion at the Mill on Thursday evening, May 24, which was great, by the way. Phyllis Agin The Mill outing was great. Even though I did not see many I worked with, it was still a nice time with great food at a great price. I'll definitely be attending more of these types of outings if planned. Copyright© 2006-2018 by The DEC ConnectionTM and DECconnectionTM. All rights reserved. E-mail the Webmaster.